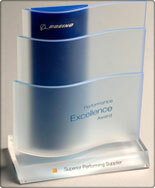 The BPEA figures into the selection of Boeing’s top honor, Supplier of the Year. Achieving BPEA status or demonstration of outstanding achievement is a prerequisite for Supplier of the Year. Boeing annually announces winning suppliers in up to 16 categories.